Recently released in a handbound edition of 500 and a Special Edition of 25, Under the Knife by Krista Franklin is now available for purchase! Part memoir, part treatise, part collage and experiment, Krista Franklin’s Under the Knife is an excavation; a dig at the sites of the construction and demolition of the poet/artist’s selves. Franklin plays fast and loose with fact at the crossroads of the history of her maternal line and her own in a ruptured conversation about inheritance and the generational traumas that blossom in the body. Under the Knife hiccups, cross-fades and stops midsentence as Franklin cuts through the illusion of memory, the pathologies of history, and the stories we tell ourselves about ourselves. Krista Franklin is a writer and visual artist whose work has appeared in Poetry, The Offing, Black Camera, Copper Nickel, Callaloo, BOMB Magazine, Encyclopedia, Vol. F-K and L-Z, and the anthologies The End of Chiraq: A Literary Mixtape, The BreakBeat Poets: New American Poetry in the Age of Hip-Hop and Gathering Ground. Her chapbook of poems, Study of Love & Black Body, was published by Willow Books in 2012. Her work has exhibited at Rootwork Gallery, Produce Model, The Obama Foundation Summit, The Studio Museum in Harlem, Chicago Cultural Center, The Cornell Fine Arts Museum, The Columbia Museum of Art, National Museum of Mexican Art, and featured on 20th Century Fox’s Empire. She is a Cave Canem fellow who holds an MFA in Interdisciplinary Arts from Columbia College Chicago, and currently teaches Writing at the School of the Art Institute of Chicago. 8.5" x 11" x 2-1/8", 280 pages. French-link handbound bookblocks coptic-stitched to clothbound hardcover colophon. Paper wrap cover foil stamped on front and spine. Printed on 5 different papers with Indigo 12000, RISO RZ 390U, and Letterpress. Design by Matt Austin, April Sheridan, Aay Preston-Myint, and Hannah Batsel. Handbinding, RISO printing, Foil stamping and casework by Candor Arts. 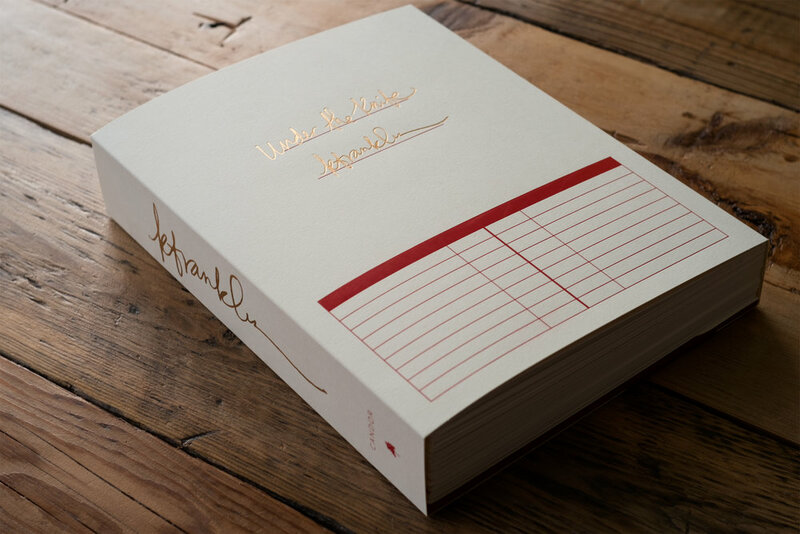 A Special Edition of this book comes in a custom clamshell box with an archival print of the artist’s work. Available here in an edition of 25.